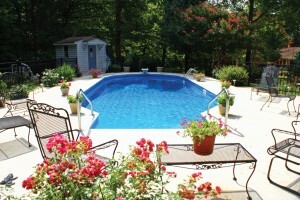 Home swimming pools can provide hours of relaxation and fun-in-the-sun for you and your family. Even though we’re months away from summer, this time of year is exactly when you want to get the ball rolling on this venture, since planning and installing one is no small feat. Before diving into a new swimming pool installation project, it helps to familiarize yourself with all the facets of the project. It’s not as simple as picking a pool template and having it installed. There are many things to consider—the slope of your land, the type of materials to use around your pool, the shape and style of the pool itself, and more. Everyone knows how entertaining and relaxing a private pool can be, but a pool project done well can completely transform and elevate the atmosphere of a home into a resort-like paradise. Before you go about researching pool designs, the first step is assessing the feasibility of building a pool into your land. John Perry of Perry Pools and Spas says that the first question to ask is if you physically have room for a pool. If the answer is yes, then you start investigating the details. “Each locality has their own set of rules for any type of accessory structure. Distance from property lines, sewage systems, and utilities are the first thing your pool contractor will assess,” he explains. Tracy Norvelle, landscape architect and pool construction supervisor of Land Tech Group, explains one tool that pool contractors use to manage less-than-perfect yards. “A flat, level spot is nice, but is usually not the case in Virginia. A retaining wall is required about 75 percent of the time.” The severity of the yard’s slope affects the cost of this kind of project, depending upon the size of the required retaining wall or other accommodation. 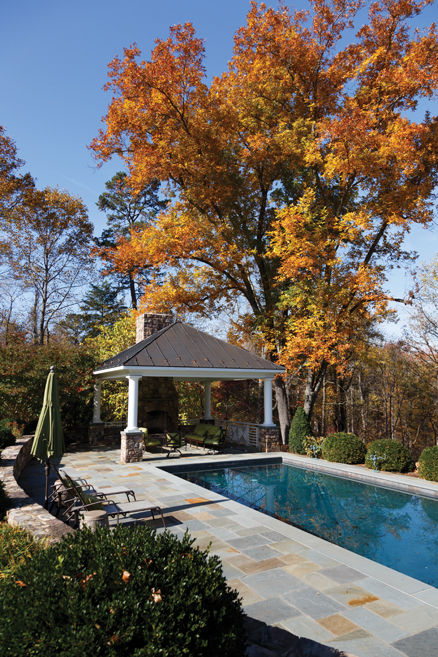 When it comes to evaluating your expenses, there is a lot to keep in mind beyond just the labor and materials required to build the pool itself. Leave room in your budget for landscaping, structural additions, fences and gates, planters and foliage, and outdoor furniture. You will also need to think long term about things such as maintenance costs, electrical expenses and changes to your homeowners insurance. Reflect on the reasons you initially considered installing a pool. Are you looking for a place for you and your spouse to relax after a long day of work? Do you have a large family with younger children? 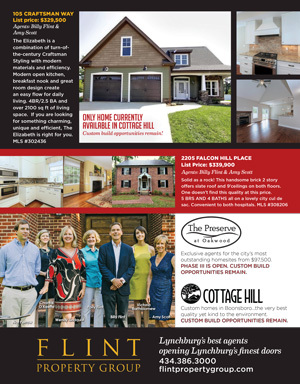 Will you want to entertain the neighborhood with cookouts and pool parties, or host more intimate gatherings? Answering these types of questions will help clarify your goals for your future outdoor space and guide you toward a personalized paradise. While many existing physical factors dictate the general location of your pool, exact orientation of the pool is largely up to you, and should be done strategically. 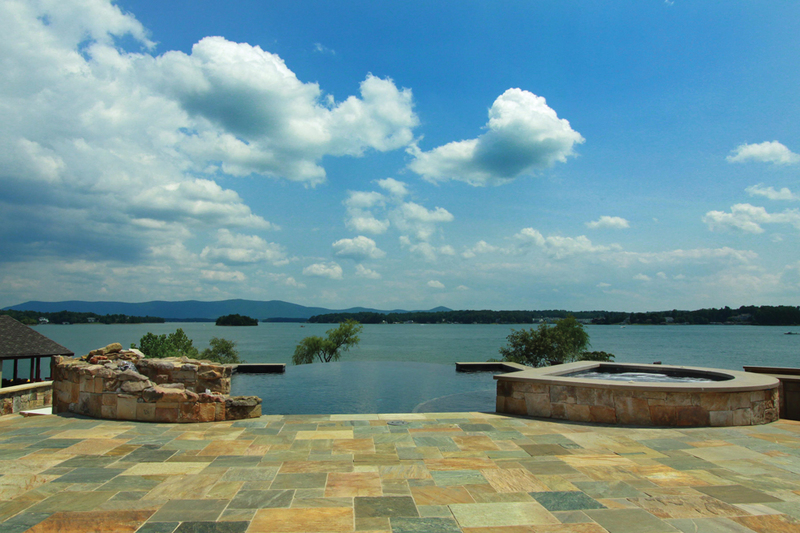 To create a cohesive space, envision the pool area not as a separate entity, but rather as an extension of your home. There should be a natural flow from the physical structure of the house to the pool, to unify the spaces. Achieve this by installing access features like paths and walkways that complement the design elements you already have in place. This is also a good opportunity to incorporate any other existing features, such as patios, along the way if possible. Accessing the pool is an important consideration as well. “Placement will depend on what is the best use of space and connecting the pool space to the home,” says Vaughan. “We typically try to arrange the pool so that the shallow end with the steps is closest to the points of access such as doors, steps and gates, so it creates a natural flow into the pool.” He stresses the importance of keeping the pool and its surrounding area “close to areas such as the kitchen and bathrooms for easy access during times of entertaining.” It is also important not to overlook the location of existing trees and tall shrubbery. Though they may not directly block the pool area, you must think about how they might create unwanted shade. If you choose to work planters and flowerbeds into the design of your pool area, there are a few factors to keep in mind when choosing how to best fill them. The most important is to opt for low maintenance. Poolside plants should be tolerant of drought and full sun, since your pool will likely receive little to no shade. It is also best to avoid “messy” plants that produce fruit, shed leaves frequently, or bloom substantially (which can also attract bees). This plant litter will inevitably find its way into the water, meaning more cleanup and maintenance. For a touch of color without too much fuss, try daylily or lily of the Nile. A few examples of suitable shrubs are sage bush, Gold Thread cypress, hosta, and pampas grass. Toward the perimeter of the yard, you may consider planting tall shrubs, such as emerald arborvitae or Leland cypress, to provide privacy. Traditional wood-based mulch can also present a problem, since it can easily skim across the concrete pool perimeter when the breeze picks up. To combat this, consider using rubber mulch to surround your plants or stone mulch to line your walkways. Each type is available in a variety of colors to fit any design scheme, and does not degrade or wash away as quickly as traditional mulch. Rubber mulch is an eco-friendly option since it is made from 100 percent recycled rubber. 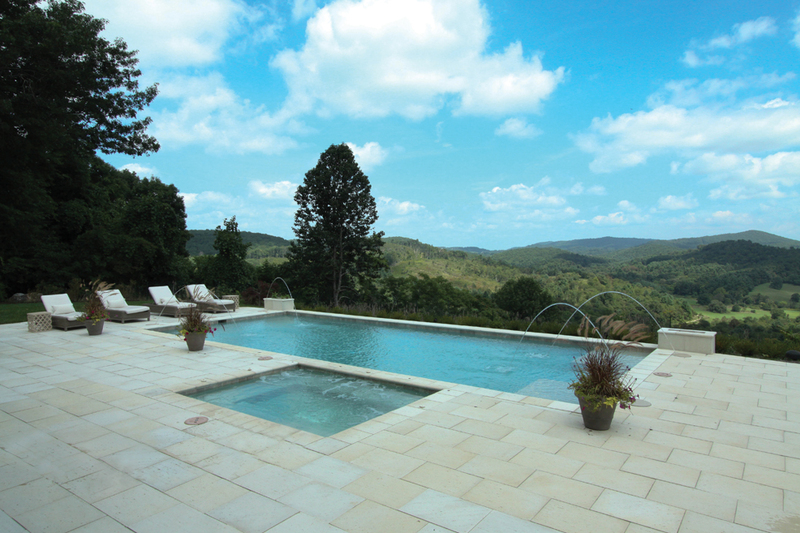 Stone mulch can provide great visual impact, especially in free-form pool environments that have an organic look. A popular choice is river jacks, which are the smooth, water-washed stones frequently seen in waterscape features. 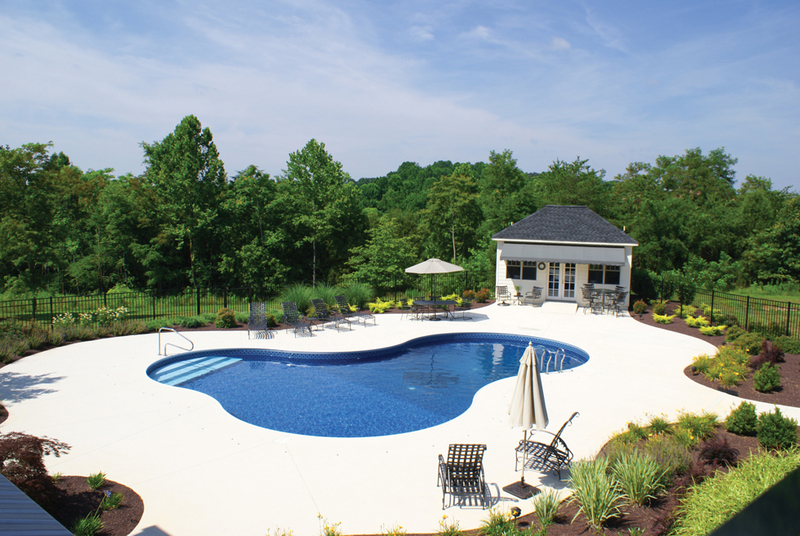 Another significant factor to consider is that private pools are required to meet specific codes and regulations throughout most of Virginia in terms of securing the perimeter of your pool area. The exact requirements vary between localities; however, you will need fencing or gating of some sort that surrounds the pool—usually within a certain height range and sometimes requiring a lock or latch. You should discuss these details with your pool contractors, as code specifications vary between localities. Don’t think of this as a hindrance to your project, but rather as another way to add a creative touch to your landscape. 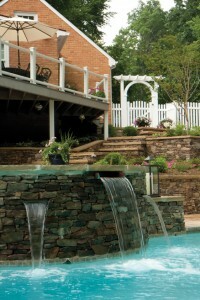 Falling water features can add tremendous ambiance to your swimming pool. 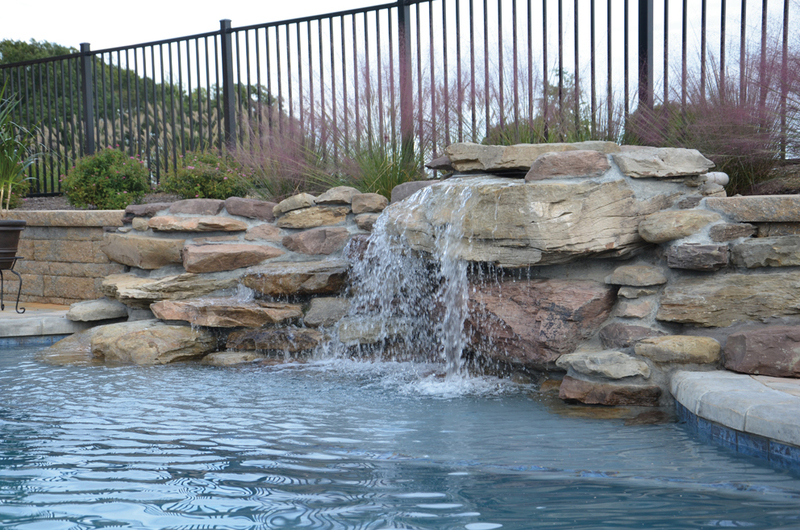 The sound of running water can be very refreshing, even when you aren’t in the pool, and provides the perfect background noise to mask traffic and other nuisances as you enjoy your pool area. There are choices to supplement any style and budget, from subtle and contemporary to grandiose and ornate. Spouting sconces or small fountains are a great choice for a formal or Mediterranean-style space. 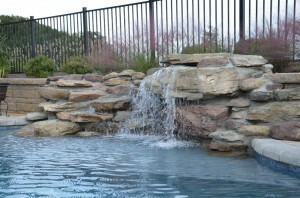 These features can be placed on top of a raised wall or along the edge of the pool. For greater impact, larger features such as waterfalls can be constructed to serve as a focal point for the entire space. 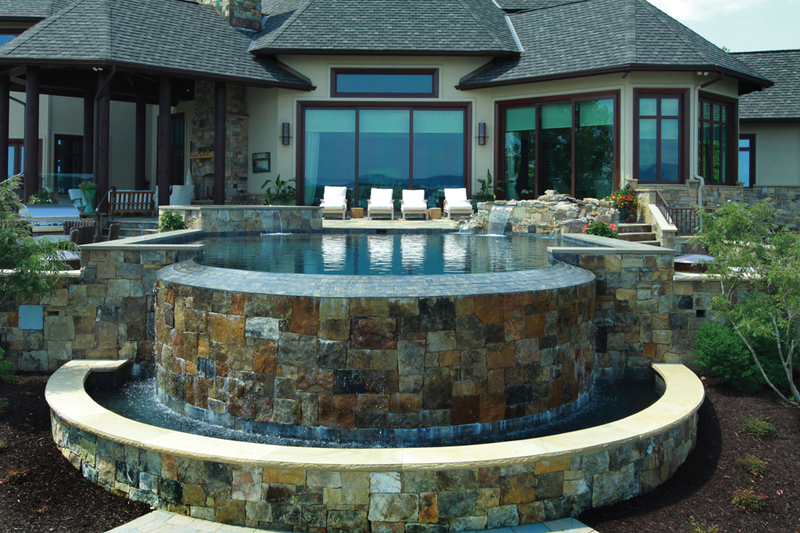 Whether it’s a sleek, modern curtain of water or a rush tumbling down natural stones, a water feature is sure to add atmosphere and charm to a pool. Perry reminds us that beyond creating a place to go for a swim, you are creating a whole outdoor living area. “Outside of the pool, the options are endless, from fire pits and outdoor kitchens to pool houses and outdoor pool tables,” he says. Vaughan explains that the majority of the swimming pools in this area are “salt water” pools. This means that the pool uses a salt chlorination system to constantly produce chlorine from the salt within it. “A salt pool is still a chlorine pool, but it does not run out of chlorine since the system can create chlorine over and over again from the same salt in the pool,” explains Vaughan. Using this type of setup can be less expensive and require less upkeep than other alternatives. A good pool cover will be needed for the off season, though it is important to realize that this alone will not prevent the growth of bacteria and algae. “We encourage our customers to operate their pools until water temperature gets below 55 degrees, which is the temperature that algae no longer grows,” says Vaughan. He says that pools that are closed too early or opened too late may encounter algae growth even with the cover on the pool. Mesh pool covers are a good choice, as they allow the water to flow naturally and not collect on top, while also keeping out unwanted debris. There is a lot of responsibility involved with building, owning and maintaining a private swimming pool. It is a project that should be approached with as much research, planning and creative thinking as you would give to a major renovation, or purchasing a new home or car. When everything is complete and you begin to enjoy your swimming pool retreat, you will know that all of the effort and planning was well worth it.